When it comes to the holidays, those plug-in fragrances can only do so much to fill your home with yummy holiday smells. Even Bath & Body Works’ sweet cinnamon pumpkin falls short when you’re talking the scent of freshly roasted cinnamon almonds occupying every square foot of your home (including your bedroom closet). It’s that same delicious roasted cinnamon almond smell that permeates the mall and has you me salivating the minute you I walk through the mall doors. 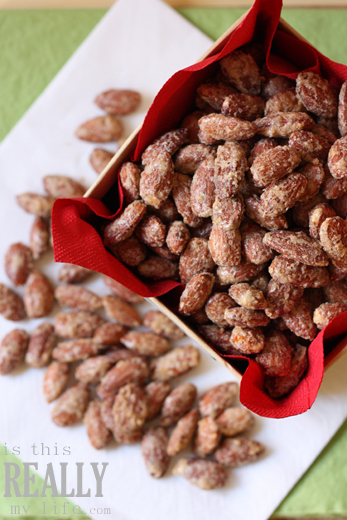 Another bonus: these oven-roasted cinnamon almonds make an easy—yes, easy—and delicious neighbor gift. We had some neighbors test them out and they were gone in record time. And that’s an understatement. You’ll find the printable recipe for roasted cinnamon almonds below. You’ll also find yourself eating the entire batch. Preheat oven to 250 degrees. Lightly grease a 10x15-inch jellyroll pan. Lightly beat the egg white. Add water and beat until frothy but not stiff. Add the nuts and stir until well coated. Mix the sugar, salt and cinnamon and sprinkle over the nuts. Toss to coat; spread evenly on the prepared pan. Bake 1 hour, stirring every 15 minutes, until golden. Allow to cool completely. Store in an airtight container. The almonds will crisp up once completely cooled. I actually think they're better after sitting for 24 hours. If you want to see what else I’m cookin’ up, head over to isthisREALLmylife.com. You can also find me on Facebook, Twitter and Pinterest. What can I say? I’m a social media gal! Don’t they!!! I can’t wait to try them! Thank you for the kind words and for featuring my recipe on your fabulous site. You are truly one of my faves! Emily is probably one of my absolute most favorite people ever. I only wish I could see her more often. 🙁 Such lovely photos and recipe too. Yum!! I LOVE those candy nuts in the malls at Christmas time… I will have to make these for sure! Just made these and they turned out great. I saw another recipe for a crockpot version that also included brown sugar and vanilla. In addition to the regular sugar I added 1/2 cup brown sugar and substituted vanilla for the water. This took less time than the crockpot and was easier. Love it. Thanks so much for posting. I’m going to have to try it this way next time! I really want to try these! Should I use raw almonds or just plain roasted ones for this recipe? I buy the raw almonds from Costco. They’re perfect! Hi! Do you use salted or unsalted almonds for this? They’ll make a great office gift! Thanks for sharing. Almonds are my favorite! now I can make these at home instead of buying them at the mall 🙂 can’t wait! What if you don’t have a jelly roll pan? Is there an alternative?? I really want to make these!! You can totally use a regular cookie sheet as long as it has edges. Ok great. Should it be dark nonstick of can it be stainless steel? I have a heavy roasting pan with higher sides than my cookie sheet but it’s not dark nonstick. The almonds will stick a bit anyway, which is why you stir them during baking. I would lightly spray the pan, though, just to be safe! These look like they would make a wonderful gift for the neighbors. Can I ask where you found the cute boxes to put them in? I actually don’t know if that will work or not. Do you have time to make a small batch and test it out? I’ve never frozen them before…sorry I’m not more help! Just found this awesome recipe and will be making for Christmas this year for sure. But just wondering if other types of nuts could be used? I have a big container of pecans I would love to use too……thanks! Could you use any other kinds of nuts – cashews, pecans, peanuts? Absolutely! You could definitely do pecans or cashews or walnuts, even. I’m not sure about peanuts, but I imagine they would lend themselves to this easily! Do these have to be made with raw almonds, roasted or either? These look amazing! I’m wondering how far in advance you think these could be made? I’m hoping to get a kickstart on holiday baking, and wondering about making them soon and freezing them for a few weeks. I’ve never tried freezing them, but I googled it, and e-how says you can freeze them if you remove as much air as possible. I’d love to hear back from you if you do freeze them! Am I able to substitute pecans for the almonds? If so is the cooking time different or is everything the same?? Is there a substitute for the egg white? My family are vegan. I’m sure that there is, but I don’t know what it would be. Perhaps just water? I’m not sure. Thanks. These look so good! They’re quite delicious! When you print the recipe it has all the instructions in there, you can see what it looks like in the post above. Emily suggests using a jelly roll pan and tells you what temperature and how long to cook the almonds! Enjoy, and have a delicious week! I tried making these and I followed the instructions to the letter. But after only 15 mins in the oven they were black! Is it supposed to be 250F or 250C? Yikes! Sorry that happened to your almonds. It’s 250° F.
I tried this recipe a couple weeks ago, and let me tell you, these are absolutely amazing! I’m about to make another batch for camping and another batch as a gift. Thank you for posting! Almonds with or without the skin on? I make them with the skin on, but if you prefer blanching and removing the skins, I’m sure they’d be delicious, too!